timebymail ... watch and jewelry accessories Shop wholesale feedback People are saying that watch repairing is a dying trade, well let us help you find top quality horologist tools and accessories at trade prices. We specialize in supplying watch repair kits and accessories to the trade, we try our utmost to supply all the tools you'll need to repair your watch, from the budget starter packs to high quality Swiss tools. Other Products shop Leather Straps 16 to 30mm Omega Dynamic Straps Stainless Steel Straps Rubber/Silicone Straps Nylon Watch Straps Swatch Straps Other Watch Parts Wholesale Watch Straps Vintage Watches/Straps Watch Tools Watch Crystals Clock Parts and Tools Jewelry Tools and Display Quality Leather Plain Style Watch Strap Sizes Available-16mm, 18mm, 20mm, 22mm, 24mm SELECT ABOVE This New Black Leather Strap is made of quality leather, it has a plain design and a cushioned feel to it. The separate parts measure approx 8.5cm (including buckle) and 12.5cm, it is about 2mm thick and the buckle is made of stainless steel. We have lug sizes from 16mm to 24mm (please select above) . 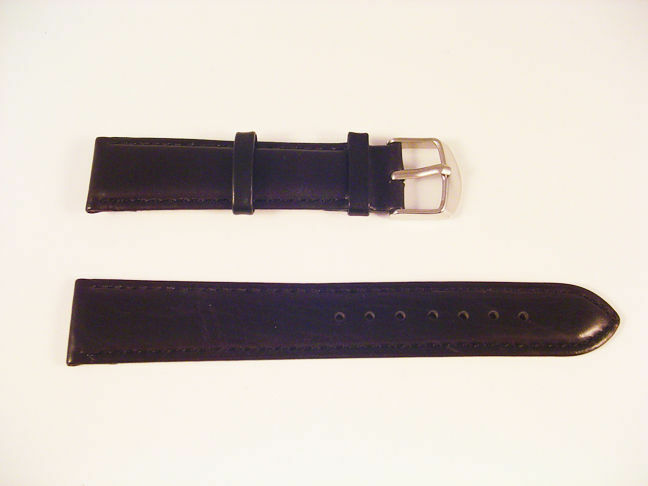 This is a lovely looking strap that is well made and will look good on most vintage and modern watches. We also have this strap in brown: item number - 310505889428 Condition - NEW Colour - Black (we also have brown item number - 310505889428) / Silver Buckle Lug Size - 16mm, 18mm, 20mm, 22mm, 24mm (Straight End) - select size above Length - approx - 8.5cm (including buckle) and 12.5cm Thickness - approx. 2mm (cushioned) Material - Leather/Stainless Steel postage and packing costs United Kingdom Free Europe 2.60 Rest of the World 3.25 all items are sent by 1st class post (not registered) If you require registered post then please ask for rates. we give discounts for multiple purchases: 2 items add 0.50 We would be grateful if you could confirm your address as soon as possible after payment is made. We are truly sorry for any inconvenience this may cause but unfortunately Paypal are giving some addresses as "Not Verified". All our tools and accessories are sold as is, we try to describe our items to the best of our ability. However, If you are not completely satisfied and you have a genuine complaint we will gladly give you a full refund (not including postage) within 7 days of purchase. All photos are stock photos and are identical to the item you are purchasing, the packaging on some items may change but the product will be the same. We pride ourselves on a quick and reliable service.